GM Dave Gettleman confirmed Manning will receive a $5 million roster bonus Monday, Ralph Vacchiano of SportsNet New York reports. 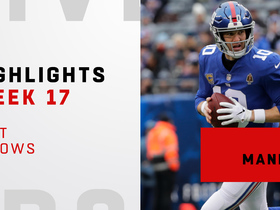 The Giants are expected to retain Manning for 2019, ESPN.com's Dan Graziano reports. General manager Dave Gettleman didn't sound entirely committed to retaining Manning for the 2019 season when questioned about the matter Wednesday, Matt Lombardo of The Newark Star-Ledger reports. "You don't know what can happen," Gettleman said. "We're evaluating everything and we just have to keep moving forward." Coach Pat Shurmur said Wednesday that Manning will remain with the Giants for the 2019 season, Ralph Vacchiano of SportsNet New York reports. Manning finished the season with passable cosmetic stats -- 4,299 yards (7.5 YPA), 21 passing touchdowns and 11 interceptions -- but a look under the hood tells a different story. Manning completed 24 of 41 pass attempts for 301 yards, two touchdowns and one interception during Sunday's 36-35 loss to the Cowboys. He also lost a fumble. 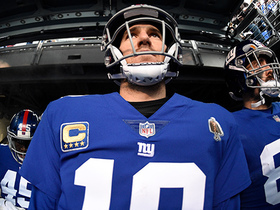 Coach Pat Shurmur called Manning the Giants' starting quarterback for Week 17 against the Cowboys, Jordan Raanan of ESPN.com reports. Manning completed 25 of 33 passing attempts for 309 yards, a touchdown and an interception in Sunday's 28-27 loss to the Colts. He also rushed twice for no yards and another touchdown. Manning will get the start Week 16 in Indianapolis, Art Stapleton of The Bergen Record reports. Analysis: Coach Pat Shurmur didn't wait long to kill any speculation about Kyle Lauletta getting the Week 16 start now that the Giants have been eliminated from playoff contention. There is some chance the rookie could take snaps as a mid-game replacement, especially if Manning struggles early against a red-hot Colts defense. Shurmur didn't comment on the plan for Week 17. Manning completed 21 of 44 pass attempts for 229 yards, zero touchdowns and one interception in Sunday's 17-0 loss to Tennessee. He also lost a fumble. 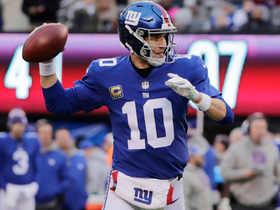 The Giants have been impressed with Manning's play in recent weeks and could keep the veteran quarterback on the roster in 2019, Ian Rapoport of NFL Network reports. "He is, from what I understand, playing his way onto the roster in 2019," Rapoport said of Manning on NFL Network's "Good Morning Football Weekend" program. "Sources I talked to, were adamant, no decision has been made firmly. This is an offseason situation. 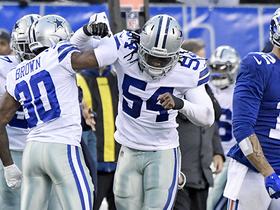 But the way he has been playing, the way he has held up certainly opens up the possibility that he is back in 2019." Manning completed 14 of 22 passes for 197 yards and three touchdowns in Sunday's 40-16 win over the Redskins. Analysis: Manning helped his team to a 34-0 halftime lead with touchdowns of three yards to Sterling Shepard and six yards to Bennie Fowler. He added an 11-yard touchdown to Russell Shepard to make it 40-0 before exiting in favor of backup Kyle Lauletta. While he won't benefit from the numerous short fields that were provided by facing a Mark Sanchez-led offense, Manning should get top receiver Odell Beckham (quadriceps) back against the Titans in Week 15. 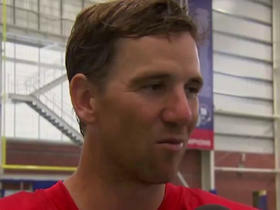 Coach Pat Shurmur confirmed Manning will get another start Week 14 at Washington, Jordan Raanan of ESPN.com reports. Analysis: Manning doesn't deserve much of the credit for Sunday's upset win over the Bears, as he completed just 19 of 35 passes for 170 yards (4.9 per attempt) with a touchdown and an interception. He'll nonetheless continue to get the nod under center, though the Giants may want to take a look at rookie fourth-round pick Kyle Lauletta before the end of the season, perhaps in Week 16 or 17. 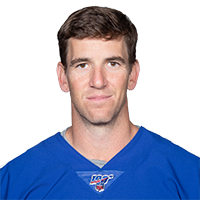 Manning completed 19 of 35 passes for 170 yards with a touchdown and an interception in the Giants' 30-27 overtime win over the Bears on Sunday. Manning completed 26 of 37 pass attempts for 297 yards, one touchdown and one interception during Sunday's 25-22 loss to the Eagles. Manning completed 17 of 18 passes for 231 yards with two touchdowns and no interceptions in the Giants' 38-35 win over the Buccaneers on Sunday. He also lost a yard on his sole rush and fumbled once but recovered. 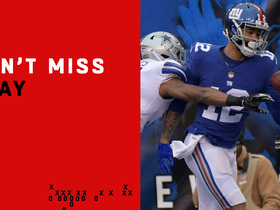 Analysis: Manning had only one incompletion -- a bad miss of a wide-open Saquon Barkley running free down the sideline -- but otherwise was more accurate than usual. Barkley did the rest of the damage on the ground, which helped lead to Manning's third-lowest passing yardage total of the season. Manning's 12.8 YPA was actually a season high, meaning that his stellar day didn't just consist of dink-and-dunk throws. He'll look to build on Sunday's effort versus the Eagles in Week 12. Manning completed 19 of 31 passes for 188 yards and three touchdowns in Monday night's 27-23 win over the 49ers. 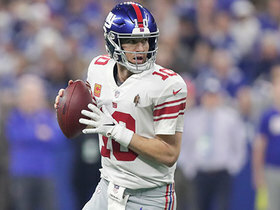 Coach Pat Shurmur confirmed Manning would retain the starting quarterback job for Monday's game against the 49ers, Jordan Raanan of ESPN.com reports. 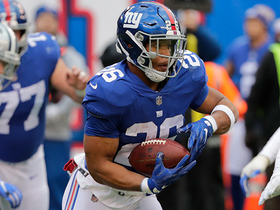 NFL Network's Kimberly Jones reports on the next steps for the New York Giants heading into the 2019 NFL Draft, how quarterback Eli Manning found out about Odell Beckham's trade to Cleveland and more. New York Giants quarterback Eli Manning discusses how he is feeling in his 15th season, what he has seen in running back Saquon Barkley and his relationship with head coach Pat Shurmur. NFL Network Insider Ian Rapoport and Tom Pelissero report the latest on quarterback Eli Manning's future with the New York Giants. The Around The NFL crew debates whether or not the New York Giants made the right decision to prioritize Eli Manning in trading Odell Beckham Jr. to the Cleveland Browns. New York Giants quarterback Eli Manning and wide receiver Odell Beckham Jr. starred in a Super Bowl commercial titled 'TD Celebrations to Come'. 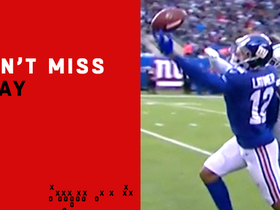 New York Giants wide receiver Cody Latimer channels wide receiver Odell Beckham Jr. on this epic one-handed touchdown catch. New York Giants wide receiver Cody Latimer makes another Odell Beckham Jr.-esque one-handed catch. Dallas Cowboys cornerback Anthony Brown plays lock down defense for a turnover on downs.